Will Stevens and Roberto Merhi are set to move up on the grid as the Toro Rosso, Red Bull and McLaren drivers will all receive penalties. Carlos Sainz: "It’s a bit of a frustrating weekend because of the grid-penalties for tomorrow’s race, but at least today we were able to extract the maximum out of the car. Actually the car is feeling great! It’s just a shame that we have so many grid-position penalties and not enough power. It’s going to be a very interesting race tomorrow and I expect a fun fight at the start, as the last six cars on the grid are myself and Max, both Red Bull cars and two world champions like Button and Alonso. I hope we can still end up fighting for some points even if it’s not going to be easy, but that’s our target." Max Verstappen: "I expected it to be a difficult qualifying session today, as we had to change the engine in between sessions. The team worked very hard and did a great job in doing it in time. To be honest, it was a surprise that we were even able to drive out before the end of Q1… and they did it! I’d like to say thank you for the big effort. Ok, we all saw that some bodywork came off the car when I was out on track, but you have to understand that they always try their best, they wanted me to get out there and these things sometimes happen when you are on the limit, fighting against time. Tomorrow’s race needs a lot of overtaking again, so I’m sure I’ll have a lot of fun. Our race pace doesn’t look that bad compared to Red Bull, and we will also fight with the McLaren’s at the start. Hopefully we can also challenge Sauber, and then see what else we are capable of doing…Let’s see!" Daniil Kvyat: "I am not sure where we’re going to start from for the race, we’ll see once all the penalties are applied. We need a good race tomorrow to try and make up some places. It’s a long race and we have to keep pushing and fighting to move up the order. We will try and put ourselves in the points, it won’t be easy at this track, but we’ll make the most out of it. We’ll see what we can do." 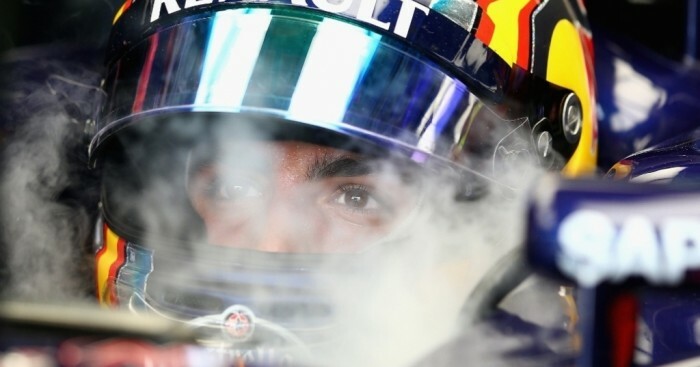 Daniel Ricciardo: "We had a new engine in the car this morning that lasted a handful of laps. I think the boys in the garage did the world’s quickest engine change to get the car out for Q1. The previous best was about two hours and I think the boys have just done it in 1 hour and 40 minutes. To do one lap was already a victory – the boys are absolute legends. I think everyone cheered when I drove out of the box and I was pretty happy with the lap. We’ll be starting from the back tomorrow and we’ll try to make up some places. The positive aspect is I like overtaking and at this track you can do it, so I’m looking forward to the challenges tomorrow." Jenson Button: "The balance in qualifying was reasonably okay, but I had too much understeer in the car. The first run felt good, and the track usually grips up, so I added some front wing, but it was probably half of what was needed. It was a reasonable lap, but even if everything had been perfect, we still didn’t have the pace to bridge the three-tenths to make it through into Q2. It’s a shame, but we always knew this would be a tough race for us. Even with a good start, we won’t be able to hold people back in the race – because we’re not fast enough in a straight line – so they’ll pass us. I’m not sure that tomorrow will be too exciting for us, but we’ll do our best. The fans have been so supportive at a difficult time – I hope we can repay them soon." Fernando Alonso: "Getting knocked out of Q1 was a bit frustrating. However, this is a period of learning for the entire team, and we need to go work through it together. You can’t seize every race weekend as an opportunity, you have to work through them and learn. We know we’re not in the best position – we’re not competitive right now – so we need to keep working in every area to improve the car. Nevertheless, this is always a special weekend; the fans have been very friendly and welcoming. It always feels good to race in front of the tifosi." Will Stevens: "We continue to have a strong weekend here, which is nice. My lap was good; not perfect. I think we could have improved time-wise, but not in terms of our position. Nonetheless, we’re improving all the time and these small gains leave us better placed to take advantage of opportunities when they do arise. I’m really excited about the race. When all the penalties are applied we’ll be starting in a good position again, but we’ll need to keep it tidy into turn 1 here to avoid getting squeezed, and damage, like we did in Spa." Roberto Merhi: "I’m pretty happy with my lap and nice to be enjoying a close fight with my team-mate. We have the car in a good place in terms of the set-up, and our grid positions will improve because of the penalties, so the aim is to keep things close with Will and get a good team result again."